Frank Lloyd Wright – ‘Frank’s Home’ – at Chicago’s Goodman Theater. 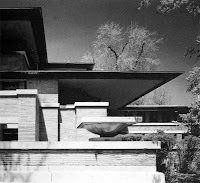 There’s far more drama just walking through any Frank Lloyd Wright-designed house, such as this one, the Robie House. We don’t even get a great set, just a desert landscape, outside FLW’s Hollyhock House. It’s 1923, Wright has heard there’s been an earthquake in Tokyo, and that his Imperial Hotel has fallen. We wait for the drama. sitting around, on that desert landscape. 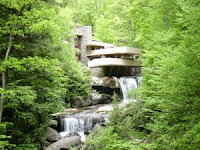 We do learn from playwright Richard Nelson, born in Chicago in 1950, that Frank Lloyd Wright was not a great father. And that great artists can be complicated people. Who knew? But we gain little insight into why that might be. We don’t we really see how others are affected, except that they become frustrated – who knew? And the play skims the surface exploring how the trade-off of family for creation might be worthwhile, even necessary. Frank and Louis (Louis Sullivan in Los Angeles! I don’ t think so! In the year we’ve burned down three Sullivan buildings here, now we do this to him!) – they convey a few interesting thoughts on how beauty is a moral issue, it is ‘right and wrong,’ ‘life and death. ‘ And about how one can find comfort in this crazy world by drawing. “Frank’s Home” wants to explore the minds of these two urban geniuses. But if this play were a building it would have to be a suburban home. how comfortably Wright’s houses sit in their environments. This production of “Frank’s Home” will run at Playwrights Horizons in New York City from January 12 to February 18. Peter Weller and Harris Yulin will remain as Frank Lloyd Wright and Louis Sullivan, and they’re very good. Henrik Ibsen’s The Master Builder ? Update: 1/31/07 The New York reviews are in. Photo from the play: Jay Whittaker (FLW’s son Lloyd Wright), Harris Yulin (Louis Sullivan) and Peter Weller (Frank Lloyd Wright). Photo by Michael Brosilow. You are currently browsing the archives for the Richard Nelson category.